The island of Grenada converted me – to the taste of chocolate. I never really liked chocolate – I know it’s shocking considering I’m a woman – it seems to be an assumption you can make about most women that they ADORE chocolate. But I never really adored chocolate. It was ok – something that I had occasionally. If given a choice for dessert, I still go for a slice of pie or a fruit crumble over a luscious dessert made with chocolate. As I’ve written about before, I definitely open myself up to trying new things when I travel – especially if something is considered local. On the island of Grenada, cocoa is easily grown, and the fermented and sundried beans sold to chocolate manufacturers in Europe. So when I first visited, I was told I had to try the local chocolate. The Grenada Chocolate Company is one of the major local manufacturers of organic chocolate truffles and bars – and after tasting what they had to offer, I was hooked. I realized I liked the slight bitterness that came from dark chocolate, and that I hadn’t liked the milky sweetness of what I had been offered in the past. Returning to Grenada, I got to visit the Dougladston Estate again, a spice boucan, where the wide variety of spices available on the island are brought to be processed – including cocoa beans. 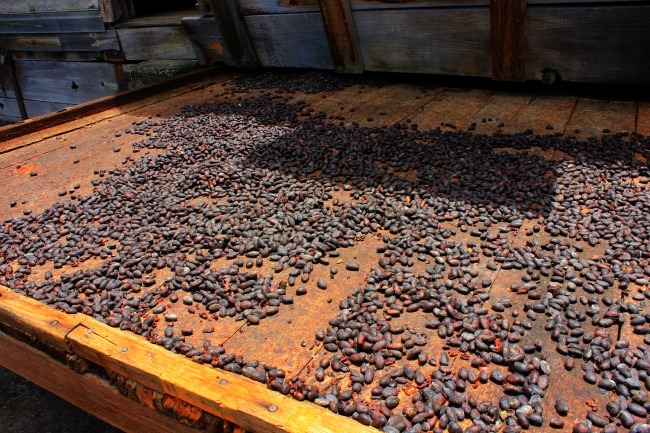 As I saw the cocoa beans drying in the sun, as well as saw the wide variety of spices inside like nutmeg, mace and cinnamon, I was happy to see the raw ingredients that made my mouth water with anticipation of tasting some local chocolate. Stripped down to its basic elements, the chocolate in Grenada appealed to my mind as much as my palate and I was grateful for the ability to understand the process and benefit from the sweet mix of cocoa, sugar and spices. And I knew I would never pass up chocolate, as long as I knew where it was from.